We are a married couple, Yvonne & Flurin, currently travelling across Canada and US, after travelling in Australia and New Zealand for 6 month. We love nature, hiking, relaxing, reading and off course have a good chat and a glass of wine. When it comes to cooking, Yvonne is the Chef, and Flurin can share his knowledge in Electrical Engineering if asked. Looking forward to meet you! Yvonne's an amazing cook and she likes kids and animals to play with. Flurin can help with general computer and electrical skills and with some knowledge in photography too. Always interested in helping and learning new things. We are curios about the wild sides of Canada, as we've never been there before. Australia's Westcoast and Backcountry was awesome, uncrowded and full of Wildlife and Nature. When we're not travelling, we life in Frauenfeld, Switzerland. Near to the German Border, the Blackforest and Lake Constanze, in a beautiful nature surrounding. 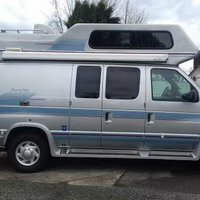 Van Conversion Travel Home, 1998, 20ft long, 12ft high. As we travelled in smaller units in Overseas, its our first "big" rig. Flurin & Yvonne spent a couple of nights at our place and am sorry we weren't here at the time to meet them in person..
You would never known they had been here and are welcome back anytime! Definitely would recommend them for others to host. Nice couple and it was a pleasure hosting you for one night. All the best in your travel quest. These lovely people were so quiet we hardly knew they were around. They are world travelers with many cool stories and experiences. A great delight to chat with. We can definitely recommend this duo to any hosts that find themselves along the path of these two. I would highly recommend Flurin and Yvonne to anyone who has the opportunity to host them. We truly enjoyed their company and sharing common experiences with them. I wish them the best on their Canadian exploration. We enjoyed meeting this very interesting and easy-going couple. They were no trouble at all. Very respectful folk travelling coast to coast. Welcome anytime. Flurin and Yvonne stayed with us one night. A lovely quiet couple - best of luck on your cross North America adventure! We enjoyed hosting these world travels and we wish them well on every kilometer they cover, by land, sea or air. A great young couple on an adventure many only dream of. Would be happy to host them again.